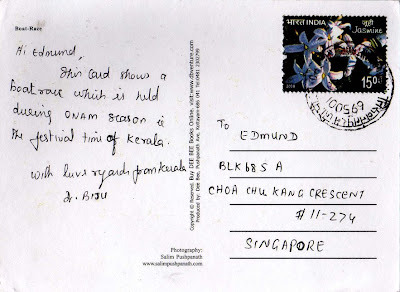 eD@HoMe: My latest mails from India! On Feb 7th 2007, just in time for Valentine’s, India Post released a special set of four commemorative fragrant stamps that smell of roses. 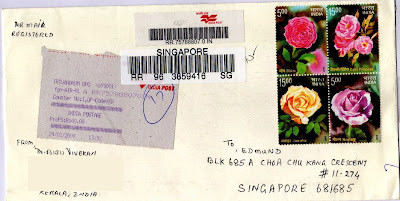 It had previously tried out its fragrant stamps when it released its sandalwood-scented ones in 2006. It was a sell-out success and many stamps collectors who wanted them were left disappointed. This time round, I managed to get hold of these lovely stamps. All thanks to Dr. Biji. 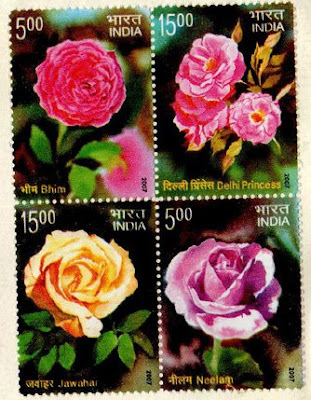 The roses pictured on these stamps are all Indian breeds. Dilli Princess in pink and the yellow Jawahar are priced at Rs 15 while the red Bheem and silver pink Neelum are in denominations of Rs five. Besides the roses cover, I also received a beautiful postcard from Dr. Biji. Thanks again! 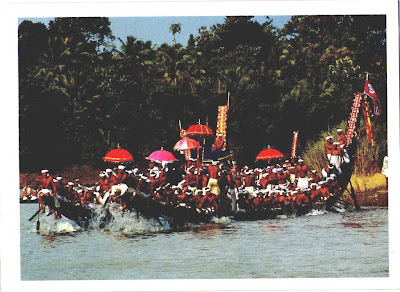 This card shows a boat race which is held during Onam Season (The national festival of Kerala). It is celebrated in the malayalam month of Chingham. Many myths surround this festival. The most important is that Onam celebrates the return of the legendary king Mahabali who ruled over a golden age. Another myth is about Cheraman Perumal who accepted the Muslim faith. Onam marks the month of harvest suggesting prosperity and happiness all around. It is a ten-day long festival, starting from the day of Atham. People decorate their yards with floral carpets during these days. Each and everyone dressed in their new clothes assemble in their homes for the traditional Onam meal. The vegetarian meal eaten on a banana leaf contains traditional dishes, pappad and payasam(sweet). The meal is followed by other activities like dance, games and boat race. The ladies perform the Kaikkottikkali (a dance form). The video clip below shows a boat race held during this important festival. It looks quite fun! Enjoy!